Love isn't something to look and search for. It's something that we open ourselves to. It's a matter of finding the love that is already within us and expressing that out into the world so that we can create the love in our lives that we desire. We all want happiness, fulfillment, and love in our lives. It's the one thing our souls strive for, yet, for some reason, it seems so much easier said then done. For many of us, it seems that there is always something in the way that prevents us from finding love. Always finding the "wrong" people to date, not feeling supported by friends or family, or simply feeling a lack of passion or purpose in life. What we often fail to realize is that love isn't something that is going to come from finding something outside of ourselves -- the "right" partner, perfectly loving and supportive family and friends, or a career that you're truly passionate for. 1. Savor each moment. Love is everywhere. It is all around us -- in the morning dew, in a warm breeze, in the sweet smell of jasmine flowers, in a piece of art, and so on. Take the time each day to really focus on these things and take in the enjoyment of it. When we allow ourselves to really focus intensely in the present moment, we can open ourselves to unlimited joy, happiness, and love. 2. Express Gratitude. Make it a daily habit to be appreciative about everything -- food, shelter, plants, books, friends, a job, a car, and whatever else. To be appreciative is a loving action, so when we put forth the action step to express our gratitude we, in turn, acknowledge the love that is within us. Gradually, over time of expressing more and more gratitude, we end up finding more love in our lives because we have been giving the loving action of thankfulness. So you may want to start every day or end every day with writing down a list of things you are grateful for. Another option would be to mentally say, "Universe, thank you for ______" (or using whatever language you prefer) every time something happens in your life that you are appreciative of. 3. Give without needs. Often times when we feel as if we've been giving too much it's because, deep down, it's coming from a place of fear. We give and then feel like we haven't gotten anything in return because there's this feeling that "something is being taken away from me" or to be quickly focusing on what one is getting rather than to really focus on the joy of giving. When we let go of any expectations, shift our mindset to "I am good enough and it's okay for me to be big in the world" and release any fears of vulnerability and rejection, we can then allow ourselves to give from a place of genuine love. A great place to start with this is to donate your time to a cause or to do some kind of work that can help those in very challenging situations. For instance, you may want to volunteer at an orphanage or help kids with special needs. It could also be something simple like helping an old lady cross the street or giving something to a co-worker in time of need. And you know the extra bonus to volunteering or doing work for a special cause? It can actually become easier to be grateful -- which is exactly one other thing we need to bring more love into our lives! 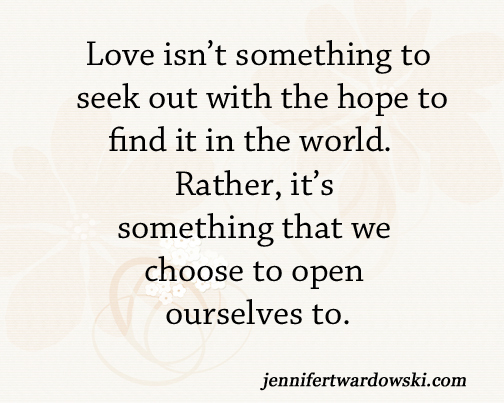 Ultimately, remember this: Love isn't something to look and search for. It's something that we open ourselves to. It's a matter of finding the love that is already within us and expressing that out into the world so that we can create the love in our lives that we desire. Create more love in your life today! In the comments below, list three things that you are grateful for in your life right now.